The itinerary allows only three days to cover a lot of ground and visit ten very different castles, from ruins to mansions; if you have time to spread the journey over more than three days you will see more and have a more relaxed holiday. Scotland’s roads are often quite narrow and twisty, designed for leisurely travel and some of them have only room for one vehicle (you have to pull in to the side at the frequent signed passing places and stop to let other vehicles pass); rushing your journey is not recommended! Day 1; The Northern Highlands of Scotland: Castle of Mey, Dunrobin Castle and Fort George, Inverness. The Highland Castles route starts in the far north, and covers the eastern area on the second day and the western area on the third day, but feel free to do it in a different order if it suits your travel plans better. 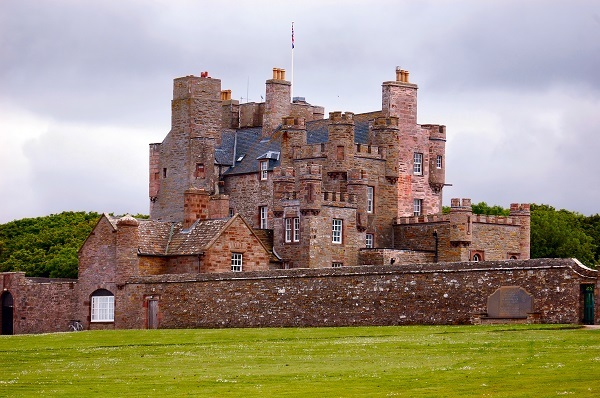 Staying with the original route, Day 1 sees you at the northernmost tip of Scotland at the Castle of Mey in Caithness. This was the summer home of Her Majesty Queen Elizabeth the Queen Mother, mother to the present Queen, and remains the property of the Royal family. They are sometimes in residence, so it would be wise to check that it will be open before travelling up there. The Castle of Mey overlooks the Pentland Firth and on a clear day you can see Hoy, the nearest Orkney island. Inside you will see the rooms the Queen Mother used when she stayed there, including her bedroom, dining room and study. There is a walled garden and grounds to walk around if you have time. To reach your second stop, travel down the stunning scenery of the east coast of Scotland to Golspie and Dunrobin Castle, one of the biggest homes in the country – it boasts 189 rooms. It’s a fairy-tale turreted white castle, and has been inhabited, added to and altered since the early 1300s. It’s been the family home of the Earls and Dukes of Sutherland, a naval hospital and a boy’s school during its long history. And, of course, it has a ghost! If you’re lucky you’ll be there during a display of falconry; even if you’re not, the gardens and grounds are worth visiting. If you feel you’ve had enough for one day, there are Camping and Caravanning Club (CCC) caravan parks with space for motorhomes at Dornoch, Tain, Brora and Lairg. If you’re still full of energy, your third stop for the day is Fort George, on a promontory jutting into the Moray Firth, just east of Inverness. Fort George has been an Army base since 1746, when it was built to help suppress Bonnie Prince Charlie’s Jacobite rising. It’s the mightiest artillery fortification in Great Britain and has a superb collection of arms and cannons on display. Fort George also houses the Highlanders’ Museum, which tells the story of the Highland Regiments from just after the Battle of Culloden to the present day. Culloden Battlefield, the site of the battle that ended Bonnie Prince Charlie’s hopes and saw the death of thousands of Highlanders, is not far away. It has an award-winning visitor centre where you can experience a little bit of what it felt like to take part in the battle. You could easily spend a whole day between these two attractions, or even at one of them, if your holiday is long enough. Fort George is managed by Historic Scotland and Culloden Battlefield by the National Trust for Scotland. At the end of the day, you’ll find CCC camping sites at Rosemarkie, Nairn, Inverness or Findhorn; tomorrow’s visits are all quite close by. Day 2; Nairn, Speyside and Loch Ness: Cawdor Castle, Brodie Castle, Ballindalloch, and Urquhart Castle. Your first visit today is to Cawdor Castle near Nairn, associated with Shakespeare’s Macbeth – though Cawdor in fact dates from the 14th century, some 300 years after Macbeth’s time! The castle has an unusual claim to fame among Scottish castles: it was built around a holly tree, which you can still see in the dungeon. It also has a very impressive Drawing Room and a bedroom hung with fine tapestries. As well as magnificent gardens and woodland, Cawdor has a 9-hole golf course: another reason for taking a little longer over the Highland Castles itinerary, if you’re a golfer. The Castle also has a bookshop, wool shop and restaurant where non-golfing members of the party can pass the time. From Cawdor it’s only a short drive through Nairn to Brodie Castle, another National Trust property. Dating from 1567 and extensively altered in the mid-1800s, Brodie is now more of a mansion house than a fighting castle. It is full of antiques, fine plaster ceilings and vintage toys. In the grounds you’ll find a Pictish monument known as Rodney’s Stone, and a local hill is said to be where Shakespeare’s Macbeth met the three Weird Sisters. For children there’s also an adventure playground. Your next stop is Ballindalloch Castle in the heart of Speyside, Scotland’s major whisky region. Ballindalloch has been lived in by the same family since they built the castle in around 1546. The original tower house now forms the core of an imposing house, full of family heirlooms. There is a fine collection of Spanish paintings from the 17th century, while the nursery displays a collections of antique toys. Other attractions include the oldest Aberdeen Angus cattle herd in the world, walled and rock gardens, and a shop that sells, among other things, recipe books written by the present Lady Laird. If you wanted to stop for the night after three castles, you’ll find a CCC campsite at Speyside by Craigellachie or at Aberlour Gardens Caravan Park; alternatively you could go back to Nairn, which is closer to the next castle on the route. 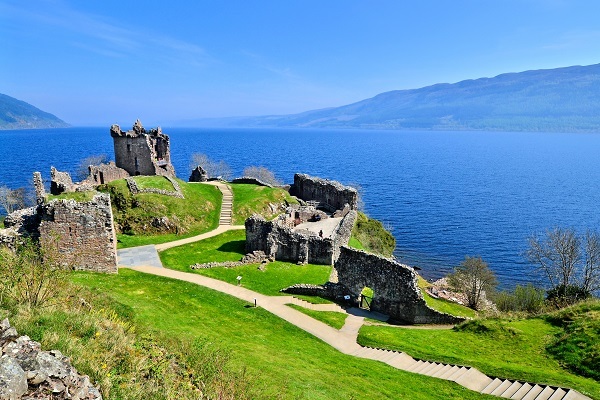 Urquhart Castle, on Loch Ness, is a magnificent ruin with 1,000 years of history and fabulous views down the famous home of the Loch Ness Monster, also known as Nessie. This is the quintessential Scottish Highland Castle, witness to clan rivalries, power struggles on a national scale, Celtic saints and scenery as dramatic as its history. If you can be there for sunset (round about 22:00 in June), you’ll get some stunning photographs. The nearest CCC caravan park is just a little further down the loch: Loch Ness Shores at Foyers; if you want to travel a little further towards your next destination, there’s a camping site at Fort Augustus. Day 3; The West and Isle of Skye: Eilan Donan Castle, Armadale Castle, and Dunvegan Castle. Your first stop today is Eilan Donan Castle, probably the most famous Scottish castle – certainly one of the most photographed – scenically placed on an island at the point where three lochs meet. Although it’s one of the most stunning castles in Scotland, its position has much more to do with strategy than aesthetics: the original castle was built to help protect the area from the Vikings. Today’s castle is the fourth on the same site, the third one having been blown up during the Jacobite rising of 1719; the present building incorporates much of that castle, and was built in 1912-32. Aside from visiting the interior of the castle, with its Jacobean artefacts, weaponry and fine art, visitors may be lucky enough to see porpoise, dolphins, otters and eagles. The historic gardens surrounding the castle have been restored and there are woodland walks in the grounds. The castle and surrounding area have views across the Sound of Sleat to Knoydart and up to the Cuillins mountains, and you may see red deer, golden eagles and sea eagles. 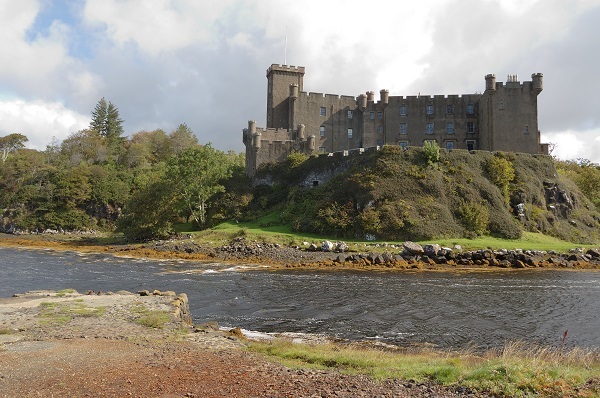 The final stop on the Highlands Castles route is up at the northern end of Skye: Dunvegan Castle sits high above a sea loch and is the oldest continuously-inhabited castle in Scotland. It has been the ancestral home of the chiefs of Clan MacLeod for over 800 years, and is filled with clan and family treasures. Not only can you see the inside of the Castle, but you can also see it from a boat. Boat trips are arranged on Dunvegan Loch to see the seal colony, and you can also hire boats for fishing. The castle’s gardens are worth a visit all on their own. First planted in the 18th century, the garden has woodland, water and formal areas as well as a walled garden with a pond, glass-house and pergola. The garden has been re-landscaped and re-planted over the past 30 years to restore it to its former glory. Near Dunvegan you will find the final recommended CCC caravan park of the tour, the Skye campsite at Loch Greshornish, right on the edge of the loch and with a background of hairy Highland cattle (the site is on a working croft). As motorhome holidays go, this itinerary is perhaps not very restful (though you can extend it – a week is probably more practical and comfortable than three days); but you will certainly discover a great deal of Scotland and of her often wild history. The Scottish Highlands contain some of the most impressive and romantic scenery in Europe, and Highland Castles and their ghosts will enthral you. At midsummer, northern Scotland enjoys 20-22 hours of daylight, so it’s the ideal time to come on holiday! Get in touch with us today to book your Highland Castles motorhome adventure.